Students from St Joseph’s College in Coalisland have put their design talents to excellent use with the launch of their new ‘Hang Out Pod’. At an event held to mark the launch of the initiative, MP for Mid-Ulster Francie Molloy cut the ribbon to officially open the new youth pod at the school, with the help of winning design student Corey Conlon. 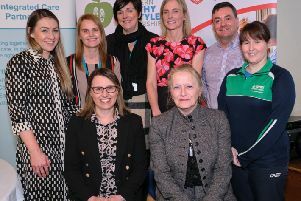 Included in the picture are Pauline Donaldson (Department of Social Development), Petra Forsythe, Michelle Ferguson (NHL), Dessie McNeill (Principal), Michael Fern (NHL), Bernadette McHugh (Breakthru Manager), Jonathan Frizelle and Sean Murray (Breakthru).